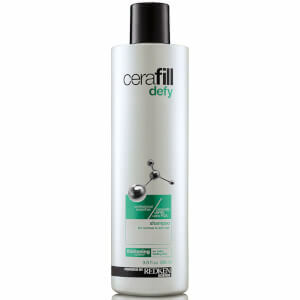 Strengthen your strands with the Cerafill Defy Hair Thinning Shampoo from Redken. Gently lifting away dirt, excess oil and product build-up from the hair whilst replenishing vital moisture, the cleanser uses Ceramide to strengthen fibres from the inside out while SP-94 promotes a healthy scalp environment to enhance volume and fullness. The hair thickening system works to combat breakage and limp locks for renewed vitality.